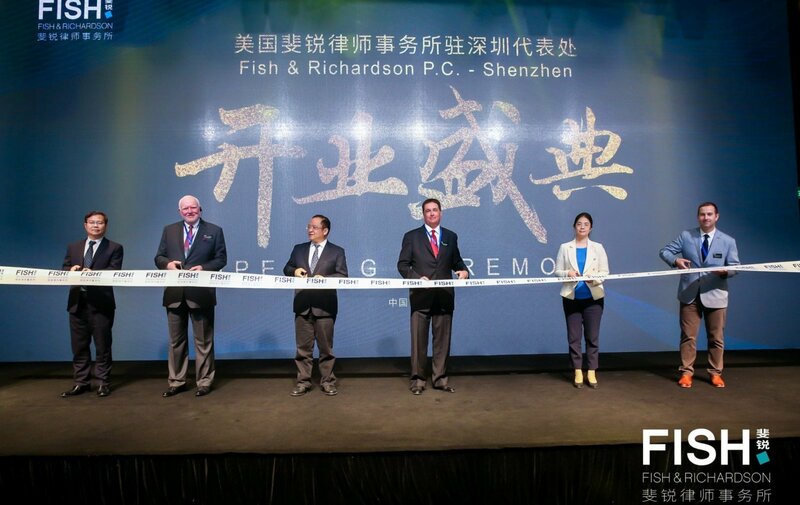 Fish & Richardson, the largest intellectual property (IP) law firm in the world, celebrated its new Shenzhen, China office with an opening ceremony attended by 100 people including local high-level government officials. In attendance were Xilin Jiang, Director-General of the Shenzhen Municipal Justice Bureau; Jiaguang Kang, Director-General of the Nanshan District Bureau of Justice in Shenzhen; Ms. Cong Lian, Deputy Mayor of the Nanshan District of Shenzhen; and Dr. Liuping Song, Chief Legal Officer at Huawei Technologies. Director-General Mr. Jiang kicked off the event with a toast to the official opening of Fish’s Shenzhen office. The event featured a presentation on “Cross-Border Intellectual Property Protection” with a panel of experts discussing multi-country, cross-border IP enforcement. The panelists included: The Honorable Leonard Davis, Of Counsel at Fish and former Chief Judge of the Eastern District of Texas, where he handled over 1,700 IP cases and managed one of the busiest patent dockets in the U.S.; Emil Zhang, Deputy Director of IP Litigation at Huawei, where he has led various high-profile legal matters, including multi-national patent disputes; Dr. Nongfan Zhu, International Partner at King & Wood Mallesons, who previously was senior IP counsel for Asia Pacific at General Electric Company; and Dr. Herbert Kunz, Managing Principal of Fish’s Munich office, who is a European and German patent attorney as well as a qualified European Trademark and Design Attorney. The panel was moderated by Principal David Barkan, one of Fish’s senior lead counsel and trial lawyers. Fish attorneys help Chinese companies obtain patent and trademark protection in the U.S. and Europe and represent Chinese companies in federal district and appeals courts, at the International Trade Commission and before the Patent Trial and Appeal Board. Fish’s office is located in the China Resources Tower, No. 2666 South Keyuan Road, Nanshan District, Shenzhen. Fish Principal Ryan McCarthy is the firm’s Chief Representative in Shenzhen. He is joined by Yong (Eric) Peng, Ph.D. who is fluent in Mandarin and English.